Senior lawyer Harish Salve, acting as the amicus curiae and Senior lawyer Dushyant Dave for the Delhi government today questioned the jurisdiction of the National Green Tribunal to issue general directions and entertain PILs. The Apex Court was hearing the petition demanding imposition of pollution compensation tax on nearly 60,000 trucks entering the capital daily. The Senior Advocates criticized yesterday’s order passed by the National Green Tribunal (NGT) banning entry of trucks not destined for Delhi and imposition of heavy pollution tax ranging from Rs 500 to 1000 on those plying through the city. The NGT order had even surprised a bench of Chief Justice H.L. Dattu, Justice Arun Mishra and Justice Adarsh Kumar Goel, which then asked the NGT to provide a copy of the order passed. The bench said it wanted to have a look at it before issuing any further directions on the issue so that there is no duplication. The court will take up the matter afresh at 10:30 AM tomorrow after it gets the NGT order. Dave said “Once it knew that the apex court is seized with the issue and is set to pass directions today, the NGT should have refrained from passing any order. Moreover it also doesn’t have the power to issue such general directions. As per section 14 of the NGT Act, it can only entertain civil cases were a substantial question relating to environment is involved”. Solicitor General Ranjit Kumar appearing for the centre and the Delhi government told the bench that it favoured imposition of stiff pollution compensation tax on the trucks crossing Delhi enroute to other states. “The situation is alarming indeed. Even my grandson has started wearing pollution masks”, Chief Justice H L Dattu said as he favoured imposition of hefty pollution tax ranging from rs 600 -1,200 on nearly 60,000 trucks from outside passing through Delhi spewing harmful pollutants”, CJI Dattu had said on Monday favouring the pollution compensation tax. He sought positive views of Centre, Delhi government and MCD on the proposal by today on a plea by harish salve, amicus curiae in pollution caserelated to a 1985 PIL filed by environmentalist M C Mehta. Most of these trucks coming from outside and bound for some other states enter Delhi as a transit route (non-destined) to save heavy toll which is charged on alternative routes. “The pollution compensation tax should be fixed as a way to equalize the difference between toll roads and travel through Delhi. 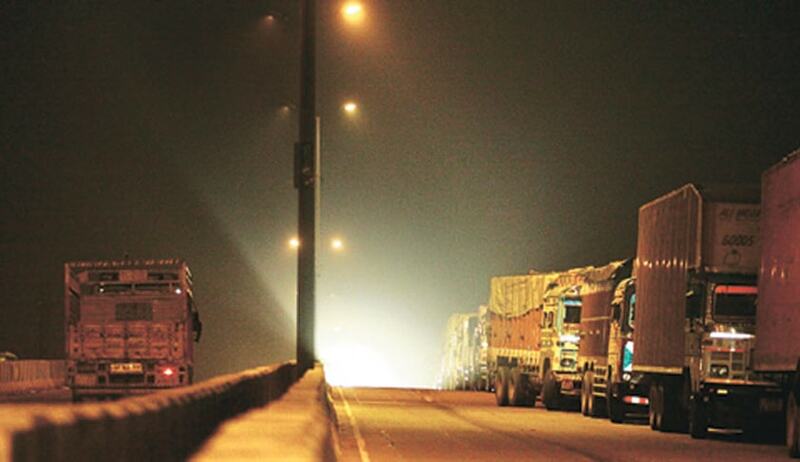 Every night 40,000 to 60,000 trucks enter Delhi to save on toll. The principle of environment law that polluter has to pay is now part of constitutional jurisprudence. It has become a constitutional imperative to recover these illegal savings (by the truckers), which are contrary to the mandate of the right to life under Article 21 of the Constitution and to use these for dealing with the consequence of pollution”, says Sunita Narain, Director General of Centre for Science and Environment who is a member of the SC-appointed Environment Pollution Control Authority which submitted a report on the issue on Monday. Salve, during the hearing, referred to the EPCA report and said a large number of commercial vehicles opt Delhi and NCR roads, instead of the highways, as it is cheaper to traverse through the capital city.